Cathal Dervan gets ready to cheer his team on. It's all over bar the singing. And there’s going to be lots of singing before the Irish take their exit from these European Championships, probably next Tuesday morning. One game down, three goals conceded, only one scored and no points in the bag. We are goosed if logic comes into play. With games against Spain and Italy to come, it is hard to see how the team that Trap picks can get anything out of the remaining fixtures in Group C.
Sure, as he likes to say, they can restore pride with a battling performance against the world champions from Spain in Gdansk on Thursday night. They might even put it up to the Italians again when they return to the scene of the Croatian crime in Poznan next Monday night. But already this looks like a lost cause for Ireland and the Irish after only 90 minutes of football. We’ll still have a good time. That much is assured. The streets of Poznan were green on Sunday. Gdansk will go green on Thursday. Poznan will welcome the free spending Irish drinkers back with open arms on Monday. The craic, as it has been at home and in Poland all week, will be ninety and the world will again hail the Irish as the best fans on the planet. Having witnessed that phenomenon at previous tournaments, I am enjoying it from a home perspective this time around. But a doubt is now gnawing at the back of my brain. A doubt a certain Roy Keane might even be proud of. On Sunday -- and I’m not afraid to admit this -- I got into the swing of things big time. Daughter Lia painted an Irish Tricolor on my forehead and on both cheeks before I went to work. An Ireland t-shirt, available in every shop in the country right now, replaced the usual shirt and tie set ahead of the trip into the Sun office in the center of Dublin. A green, white and orange wig was produced and worn with pride. I even had the photo I am happy to share with you taken just to prove my membership of Trap’s Army – the Budweiser bottle was emptied the night before by the way, just in case the boss is reading! I wasn’t the only one at Sun Towers to go as green as Kermit for the day. Even an Englishman who works with us was shouting for Ireland, Ireland, Republic of Ireland as we prepared to “rev it up and here we go” like the Italia ’90 song suggested. I looked silly, sitting at a desk with face paint and a ridiculous wig, sillier still sitting in on the news conference that decides what makes the front and back pages of what is now Ireland’s brightest daily – an easy choice last Sunday by the way. For once -- and there are some out there who will think this is a regular occurrence -- I was a media clown and more than happy to play the part. Ireland were about to play in a major tournament and I wasn’t sitting in a press box, biting nails and taking notes. I was free to watch it unfold on the flat television screen in front of me, free to shout and to scream and to cry if the need arose. Little was I to know that all three abilities – the shouting, the screaming and the crying – would come in handy after only three minutes of action against Croatia on Sunday night as Ireland committed European Championship hari-kari. We screamed in anguish when that first goal caught Shay Given unawares. We shouted in delight when Sean St. Legend equalized. We abused the ref when he allowed the Jelavic goal just before halftime. And I think I threw a pencil at the television when Mandzukic grabbed his second goal, off the back of Shay’s head, as Ireland fell asleep again at the start of the second half. By full time, the face paint was running down my cheek and said cheeks were starting to turn red with anger and dismay. I didn’t have a pen at hand, but I did have a critical head on me. Anyone within earshot heard me question Trapattoni’s sanity, not something I would normally have any right or inclination to do. Why, I wondered, did Ireland lack a sense of adventure after clawing their way back into the game and equalizing through St. Ledger, to give him his real name? Why did Trap not take an out-of-sorts Robbie off earlier? How did he ever think Simon Cox was going to be more effective on the wing than James McClean as a substitute for Aiden McGeady on the left? Why were Ireland asleep at the start of both halves, a little detail he has been preaching to us about for the four years he is in the job? Why did we sit so deep against a ball playing midfield? Why did we allow Modric so much room? Why did Given play when he clearly wasn’t fit? And why, as Roy used to say, were we happy just to be at the tournament? There, I’ve said it. Watching from afar on Sunday night, I was struck by that old Irish trait Roy used to complain about. As Eamon Dunphy did one of his famous u-turns on RTE television and slammed Trapattoni -- not something he did before the game as Liam Brady rightly pointed out -- I was siding with the former captain who opened the tin of worms many years ago. You could say Ireland lost on Sunday night because Croatia were the better team, but we have often won big games in big tournaments against better teams as the English and the Italians will quickly tell you. You could also suggest that Ireland lost on Saturday night because the players were in awe of the occasion. They may have got sucked into the unreal atmosphere within the stadium, they may have been looking at the stands packed with the “Ole Ole Ole” brigade when they should have been defending in the first three minutes of either half. They were more worried about arguing with the legality of Croatia’s second goal that they were interested in stopping it, the old persecution complex from Paris resurfacing again. Yes, they ultimately weren’t good enough. 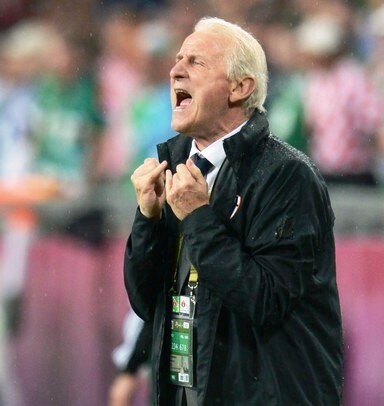 Man for man we were beaten on the pitch and in the dug-out on Sunday night as Trapattoni lost the tactical war to younger man Slaven Bilic hands down. But that’s not the only reason we lost the game. I suspect several players, just like me back in Dublin, got caught up in the emotion of it all and the sense of occasion we have been lacking for a decade now. Tournament naivety, in my mind, was one of the reasons Ireland lost to Croatia in Poznan last Sunday. Too many of us were happy just to be there, but now the sense of occasion is out of the way maybe we can put on a show against Spain on Thursday and Italy next Monday. After Croatia I don’t expect Ireland to win either game, but I do expect them to perform like a team that believes they belong on this stage. Trap has to make changes. He has already said he won’t start McClean or drop Robbie, both criminal decisions, but he will shake things up. He needs to do that on the pitch and inside his own head. The Italian infatuation with sitting back, as we did after St. Ledger’s equalizer, will get us nowhere against the Spanish on Thursday night. Tight defense and long balls forward won’t work against the reigning European and world champions, and even if Wes Hoolahan and James McCarthy are becoming better players by their absence from this tournament, Ireland need to be as adventurous on the field as the fans are off it for the rest of this Euro 2012 odyssey. And no, I won’t be wearing the wig or the face-paint second time around. Just the jersey. With pride. All I expect in return is that Trapattoni earns his lavish wages and my respect. A win against Spain would tick both boxes. And there I go again -- living in hope! THE 20,000 Irish fans -- and I suspect the figure may be higher -- who ventured to Poland for the Euros this week are the real heroes of the tournament. By and large they have behaved themselves, drunk the place dry and shown the world what it is like to be a real football fan. I particularly liked the Father Ted inspired gang who held up a “Down with this sort of thing” banner as Croatian fans attempted a mini-riot with local police in Poznan on Sunday night. Brilliant. SKY News showed footage all day Sunday of an Irish fan, beer in hand, trying to calm Croatian fans down as they fought with police on the town square in Poznan. He must have been senseless not to know any better, but caution would be a better value in the future in such circumstances.